Blandwood was the Greensboro home of North Carolina governor John Motley Morehead (1841-45). The original structure consisted of a wooden dwelling that was constructed in approximately 1825. In 1844 Morehead contracted innovative architect Alexander Jackson Davis to expand the residence, and Davis devised a Tuscan-style addition of four rooms centered around a tower. A kitchen and an office were connected to the main house by vaulted arches. Upon Morehead's death in 1866, the mansion remained in the family until 1896, when a drug and alcohol rehabilitation organization known as the Keeley Institute of North Carolina leased, and later purchased, Blandwood. The building served as a rehabilitation center until the 1960s, but by 1965 the property stood empty and in danger of demolition. The trustees of Guilford College acquired Blandwood in 1965 and served as a holding agency until the newly created Greensboro Preservation Society could raise the funds to maintain the property. In 1968 the society purchased Blandwood from the college with the aid of a grant from the Department of Housing and Urban Development, and the next year the General Assembly appropriated money for renovation. The National Register of Historic Places listed Blandwood in 1970, and by 1975 it was substantially restored, furnished with original and period items, and available for public visits. The restored carriage house serves as a gathering place for meetings and social events. 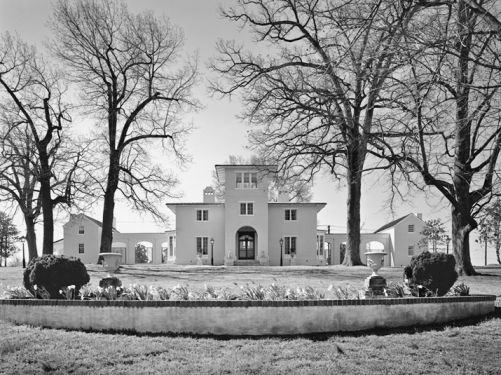 The oldest example of Italian villa architecture in the United States, Blandwood is operated as a house museum by the private, nonprofit organizations Preservation Greensboro, Inc., and the Blandwood Guild. Mary Lewis Rucker Edmonds, Governor Morehead's Blandwood and the Family Who Lived There (1976).